Just a note to let you know that I’m okay. I’ve been spending my time making remarkable discoveries. I won’t expect you to believe them. An example, did you know that the planet is a work in progress? There are places in the forest where the seams show, where there’s no stuffing, there’s no clockwork, you can slip right through. I’ve seen it! 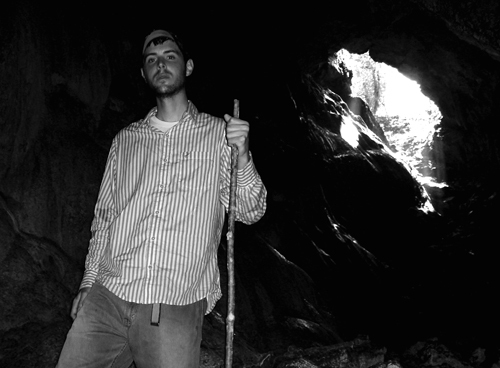 The warm hum of the woods was behind me as I stepped into a total black of silence and cold. But there are unattended atriums and parlors and strange chambered halls. And over here you can walk, then only hunch, then just crawl, then simply slither. And over there the path drops away into an abyss for no reason at all. There are no stairs or rails, no sign that human beings have any business here behind the scenery. My hypothesis: an error in Creation; a Typo, a misplaced Decimal, a bubble in the Clay. But with the convolution and moisture, I wonder if this might be earth’s middle ear? So quietly, “Thank you” on our behalf just in case. I was supposed to be taking measurements in the communal forest, but I was distracted. Because just thirty meters beyond the tree line, mere minutes into our hike, I became aware that we were surrounded by the sights and sounds of completely new birds. Kate named the birds as they appeared, and even if they didn’t, she picked them out by ear. Kate is a current graduate student and volunteer in the town of Totonicapán, working in the forests above the city. The communal forest belongs to a 500 year-old consortium of 48 indigenous groups. The organization protects and manages the land and they’ve asked Kate to study the health and composition of the forest. She collects data in order to “describe” the forest, which sounds deceptively qualitative. She takes measurements in a series of randomly-selected 23 meter square plots. She measures ground cover, canopy cover, canopy height, dominant vegetation, and vegetation densities. 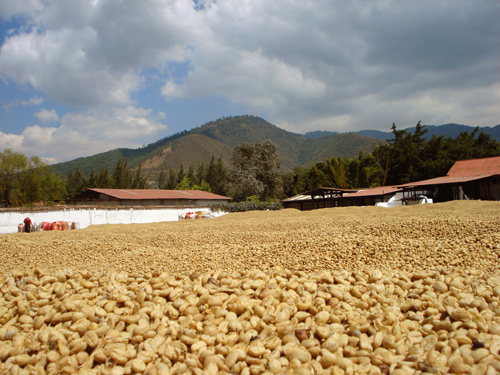 The pine-oak forests of Totonicapán are located between 2,500 and 3,300 meters elevation. But unlike the moist cloud forests further north and east, the Toto woodland is dry. Steep dirt paths and strategic firebreaks interrupt the thick red carpet of dry pine needles. High in the trees, exposed trunks glisten in the sun, honeyed with crystalline streams of resin. And it’s cold. It might be a familiar environment for someone from Colorado, North Carolina, or even New Jersey. But pine forest is not what we think of when we picture Central America. To confuse matters, the pines and oaks haphazardly sprout bromeliads as if the tropics were maintaining territorial claims despite the altitude. “This is the point where the biological waves crash.” Kate explained. Central America is the intersection for continental life forms from North and South America. Toto is the southernmost frontier for fir trees. There’s a single endemic species (Abies guatemalensis), which is endangered thanks in part to harvesting for Christmas. Among the branches there’s an unusual endemic of southern origin (Tillandsia guatemalensis), a conspicuous bromeliad that can withstand the low temperatures and acidic conditions of mountainous pine forest. But the birds of Toto are the primary attraction. Many species reside in the forest year-round, but seasonal migrants come and go throughout the year. So I got to watch robinlike thrushes, garrulous warblers, and ghostly yellow-eyed juncos. I heard the call of the brown-backed solitaire (locally considered the most beautiful song in the world). Hummingbirds lanced through the flower-patches like territorial lasers. The pink-headed warbler is an endangered songbird that is only reliably found in Chiapas, San Marcos, and Totonicapán. But in Toto, it’s locally common. Some of the field-edge trees were ripe with these bright pink, feathery fruit. Deep in the forest we found a bold pair of mountain trogons, ancient looking birds related to the quetzal. The mountain trogons have green backs and red breasts with long black and white tails. I spent three days in Toto working with Kate and asking all my questions. I receive my site assignment tomorrow. With luck, my work site will be as interesting as Totonicapán. With even more luck, it will be a bit warmer. But Dokkie (probably spelled “Doggie,” but pronounced more like “Tukkie”) is brazen and affectionate, a surprising gem! She’s a little dippy, but her personality compensates for her light head. Plus she’s got a good face. I find Dokkie in the mornings posted on the roof of her house watching the world wake up. 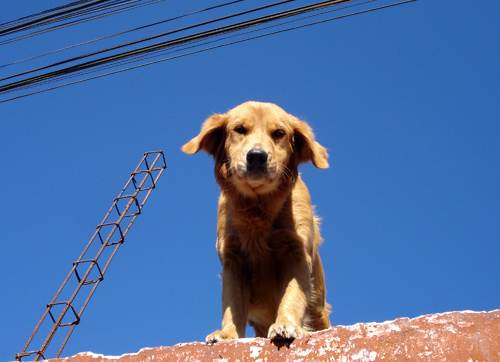 But unlike other dogs in this town, she has the freedom to come down from the roof whenever she wants. Dokkie lives with Marcosuerte (of course) and enjoys a luxurious indoor life. But she does escape once in a while. Which explains the mess she made the day we returned from FBT. Just look. Dokkie does wander away and forget her new little family sometimes, but it’s fascinating to see a dope like her perform the duties of motherhood. 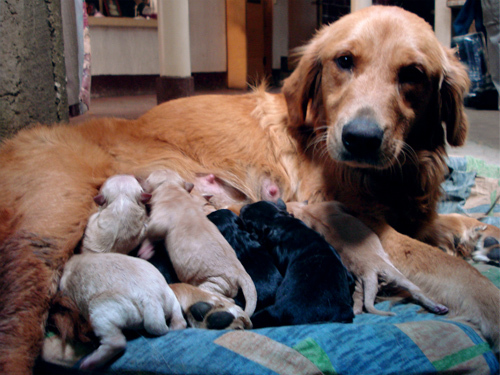 She cleans and organizes the babies and she stops stepping on them if they cry. I worked at the animal hospital in Fredericksburg for 28 months and resisted every opportunity (and there were a few) to adopt little creatures like these. So what is it about these folded faces that makes me consider policy revisions? FBT is a week-long excursion. Thirteen of us including the training director, an active volunteer, and a Spanish instructor crammed ourselves into a little Peace Corps van and set out to see the country. Chilasco, Baja Verapaz is a community of wooden houses and dirt roads. Traveling there means winding steeply up the mountains and into the clouds. It’s perpetually cool and it rains eight months out of the year. The forest flourishes despite constant cloud cover and lack of sunlight. The canopy is short and open compared to tropical forests in the lowlands, but the density and diversity of plant life is extreme. 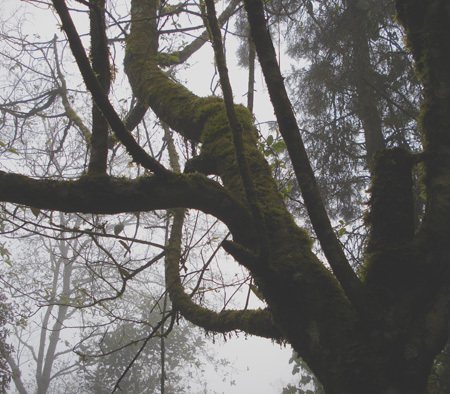 The muted sky has favored plants that can tolerate dim conditions. As a result, ferns, which are typically understory plants, have proliferated and dominated. Fronds of every conceivable shape and variety unfurl at all levels. Tree ferns tower like Carboniferous relicts above the path, bearing huge feathered leaves and fist-sized fiddleheads. In the heart of the forest, Chilasco Falls thunders across the rocks. 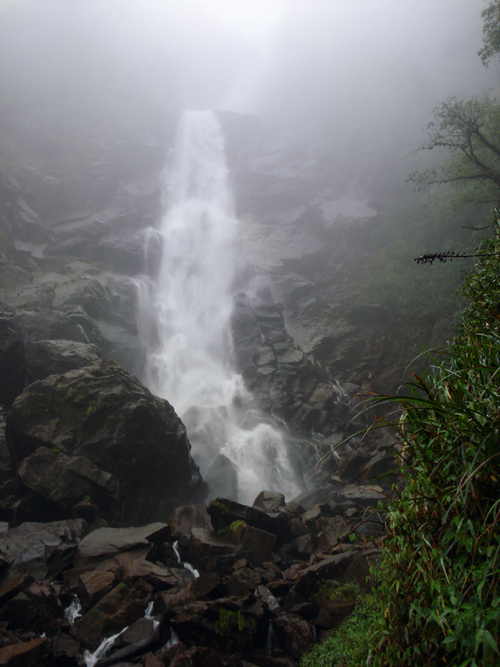 The source of the waterfall disappears in the atmospheric haze. It’s easy to think that there’s no source at all, that the clouds simply coalesce and tumble out of gray space. In a bar in San Cristóbal Verapaz we met a girl from Tokyo serving in the Japanese version of the Peace Corps. She didn’t speak much English and we obviously don’t speak any Japanese, but despite the thousands of miles between our home cultures, we were able to communicate in Spanish. Meanwhile, a gang of inebriated Guatemalans took great care to teach us every version of the Guatemalan handshake. The next morning the earth gently shook me awake. The epicenter was probably unpleasant, but it was somewhere in Mexico. For me it was just a lazy back and forth. In Chicamán we toured an old-growth forest on private land called Puente Piedra Maya Soch. The property contains multiple postclassic Mayan archaeological sites. There were two stone temples covered over with vines and a cave decorated with ancient pottery. The forest spilled over with streams and waterfalls. After lunch, Don Julio took us down the hill where he was processing sugar cane. A gas-powered press was chewing up tough purple stalks and a dark rivulet was streaming into a wood-fired cauldron. Don Julio redirected the stream into a styrofoam cup and we drank the sweet black water. Guatemala was not designed with huge spider-legged gringos in mind. There isn’t a mode of transportation in the whole country that doesn’t require body-folding and kneecaps pressing uncomfortably against the seat in front. The size difference between North Americans and Guatemalans was most obvious at a disco in Antigua two weeks ago. As I entered, I scanned the floor for the nonexistent steps, assuming that I needed to step down to where the people were dancing. But the size difference is less amusing at dinnertime. 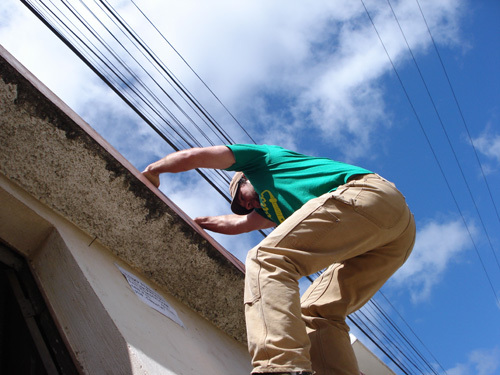 After a few nights of Guatemalan-sized dinners, some of us decided to take self-preserving action. After a burger and fries in a small restaurant in Uspantan, we crossed the street for tacos. Then it was around the corner for ice cream. So we tried a repeat performance on a different night. During the taco phase, John admitted that he felt guilty eating two dinners. Just as he finished regretting dinner 2, our APCD, who ate dinner 1 with us, happened to walk by. “Are you guys still eating?” he asked us. The gluttonous Americans were exposed. John finished and left. But for me it was time for ice cream. I don’t think anyone could have predicted the importance of ice cream. There was a contagious childlike enthusiasm for it. At several points in the trip, excited groups of gringos were running down crowded Guatemalan streets shouting in anticipation of waffle cones. One night, back in Uspantan, Chris (“Tex”) and I were walking back from the ice cream tienda happily eating our frozen treats. But suddenly, as a result of what Chris would later refer to as “a risky lick,” his scoop rolled out and hit the ground with a dead splat. A selection of English phrases escaped as we stared at the sacrilege. At first I thought I’d better scarf mine or I’d have to share. But before I could do anything, Tex handed his empty cone over to me, flicked out his knife, and lifted his ice cream off of the black street. I watched as he sliced the bottom off of the scoop and reinstalled it in the cone. In this new life of dependence and confusion, we were falling backwards through the stages of maturity. We were babies in grown bodies. The transformation was complete with more than one incident of pooped pants. It probably sounds abnormal. But to us, and to anyone who has spent a week on the road in Guatemala, it was completely understandable. Embarrassment was minimal if it existed. Even so, I won’t say which members of the group had oopsies except to say that it wasn’t me. 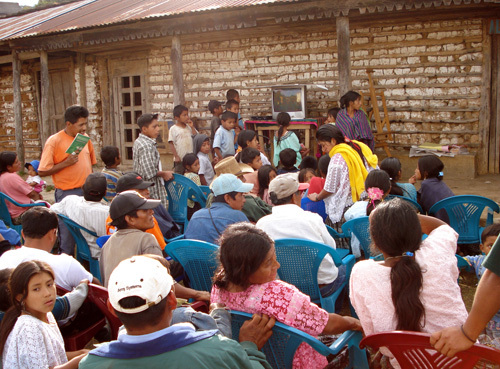 Pajuil is a remote indigenous village two hours outside of Chicamán. Our assignment was to deliver a series of short presentations in Spanish to the local people about ecological and cultural tourism. The people in Pajuil speak Pokomchí. Most of the men speak Spanish as a second language in order to do business outside of the town, but the women needed a translator. Pokomchí is an indigenous Mayan language, but it incorporates some recognizable Spanish vocabulary. Each word begins with an abrupt consonant or guttural click, and ends with a rising or falling syllable. I got the distinct impression that the language was English in rapid reverse. So each member of our group presented a topic to the gathered villagers. We were trying to bring a little education about the needs and expectations of international tourists because Pajuil has a lot of potential to attract visitors interested in traditional Guatemalan cultures. In case you are not familiar, “Turistas” is a slasher film about young Americans visiting Latin America who get kidnapped and murdered in an organ harvesting operation. I don’t know if it was a Pajuilian joke, a dramatic case of inappropriate film selection, or a subtle threat, but we didn’t hang around to sort it out. A week on the road is a long time, but I was a little reluctant to return to San Bartolomé. Field based training was a success. We had good food and more adventures than you would care to read (vine swinging, river tubing, marimba playing, guacamole eating, and I’m pretty sure I discovered a salamander new to science). The group was good company and the van only left without me one time. The fruit is small and red. The seeds possess chemical protection against insects. 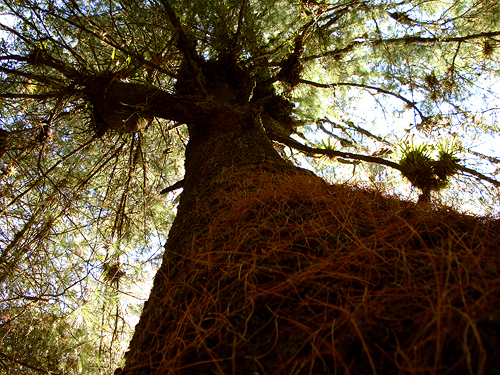 The trees were born in Ethiopia, but thrive at this altitude. And in this country, they mean money. The red pulp is separated by blasts of water, the naked seeds are fermented for two days in concrete vats. Now they’re spread golden across the expansive courtyard, arranged into peaks and troughs, undulating from one distant wall to the other, a captive ocean! The women step over the waves, pressing them forward, pulling them over, exposing every seed to the sun. Once dry, the paper coats are blown off in a machine. At 400 degrees, the defenseless beans are churned and roasted for eighteen minutes. The line between done and overdone is extremely fine and the man pulls smoking samples every 10 seconds to check for color. Six and a half pounds of red fruit yield one pound of brown coffee; 40 cups. Yet in this country of coffee I, like most of the people here, have grown accustomed to my morning cup of black instant. So indoors, sampling the Antiguan medium-roast, the first good cup of coffee I’ve had in four weeks, and possibly the best cup of coffee I will ever have, I’m not thinking of my mornings in-country. It’s not Guatemala I’m reminded of. But the truth is, my acquisition of the language is far from fluid. Immersion isn’t enough, it requires study(!) To make matters worse, there’s competition in my very house. Baby Mario, the parrot, and myself are all simultaneously struggling to compact the library of Spanish lexicon into a brain-sized snack we can nibble down and regurgitate. Now, one might argue that with the biggest head, I have the advantage. Too obvious. The fact is, my competition has had a promising head start over me. While I’ve been here for four weeks, Baby Mario has had almost nine months of full immersion. No one knows for sure how long the parrot has been studying, but she’s lived here for at least a year. Furthermore, I believe the field is leveled by the differing expectations of competence. Ultimately, I will be required to navigate the intricacies of a foreign culture and defend each of my clumsy faux pas to host country nationals. But Mario and the bird only need enough Spanish to request food and an occasional clean up. Because Baby Mario has not uttered a single Spanish syllable with clarity since I joined the family, but still he smiles across the table at me with a full spoon and a dry chin! 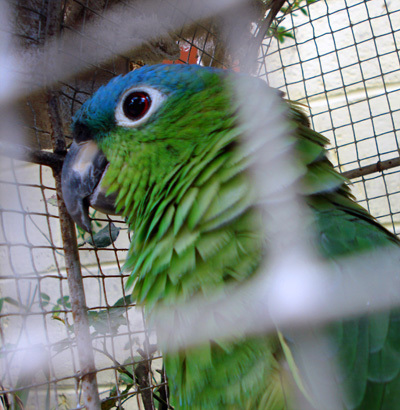 And the lora barely knows the mechanics of proper sentence construction, but every morning she calls out, “Ocho!” and gets a beakful of tortilla for her green gullet! And a short while after my arrival, my family informed me that Baby Mario fell into a dream. I nodded and told them how nice that sounded. This distressed them because even though I heard “sueño” (dream), what they actually said was “suelo” (floor). So my technique requires polish. To make matters much worse, as I left for training this morning, I happened to pass the parrot. As I did, she called out, “Gordo!” and blinked up at me with one red eye pointed squarely at mine. I suddenly realized that the damn parrot had mastered the insult. No retort from the giant, she sat back satisfied. I excused myself to the cobblestone streets of San Bartolomé, my edge no longer guaranteed. It’s more than the subtitle of my town. 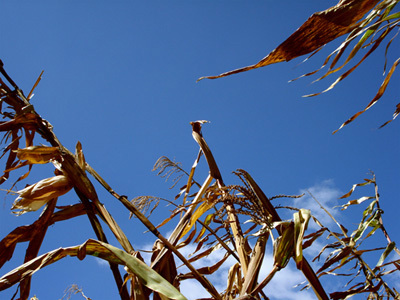 The milpas are the cornstalks. They’re pretty alta, at least twelve feet high and indispensable to the people. During my first week, Don Rodrigo leaned across the dinner table to say, “Hombres de maíz” as he flexed an arm to prove that the hot stack of corn tortillas would make a powerful Guatemalan out of me. A steaming towelful of tortillas compliments every meal, from soup to eggs. The maíz was sacred to the Guatemalan natives of the past, and that belief persists today. It’s forbidden to throw a corn tortilla on the ground or in the trash. If it must be disposed of, it should be offered to an animal. After church on Sunday, my family took me out to a plot of land they own. I wandered the property eating sweet lemons and walking between the orange, avocado, and pomegranate trees. In town I’m one of the tallest, most visible objects. But here on my family’s terreno, I was suddenly dwarfed by corn. My family was busy setting something up as I introduced myself to the farm dogs and met the pheasant among geese. Although my family is Catholic, San Bartolomé is located in a Cakchiquel indigenous region. My family doesn’t retain a lot of indigenous influence, but Doña Eva uses Cakchiquel pronunciation in her spanish. She replaces the ‘r’ in some words with an ‘x’ which makes a ‘sh’ or ‘sch’ sound which can be very confusing, especially when some words are spoken in shorthand (today she asked if I wanted a snack (refacción), but she shortened the word to “refa” and pronounced it “xefa,” which sounds like “schefa,” which means nothing to me). When I caught up with my family, they were carrying lit charcoal and incense in a clay pendulum. 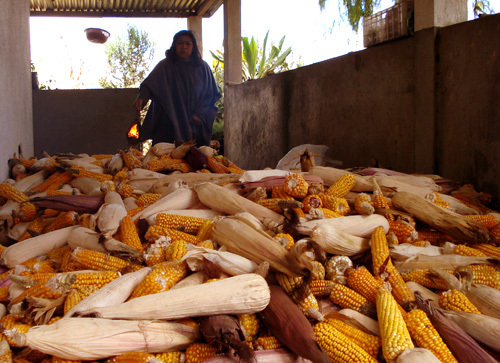 We entered an open concrete and tin building where huge heaps of corn were drying. My family blessed the corn in the name of Saint Mary and thanked the Trinity for its provisions. Doña Eva swung the pendulum over the stores of corn and blessed them with the smoke. Even though the ritual manifested as Catholic, its purpose and importance predate European influence. I found myself much more interested in the extant indigenous character of Guatemala. Before I arrived I was nervous that I would have to learn one of the 21 native Mayan languages in addition to Spanish. But the closer I get to the culture, the more I hope I will get to live in an indigenous region and pick up some useful K’ekchí. After sending 36 of us to this country, Peace Corps split us up into smaller groups and sent us to live in various communities to complete our training. There are three of us in San Bartolomé: John, Mark, and me. Each of us was specially selected for our unique strengths and talents which will be an asset to PC Guatemala. So here we are, like Xavier’s youth or the Teen Titans, learning to harness our mutant abilities for the benefit of mankind in a small town that doesn’t know what to think. John (AZ) was the obvious first pick for the team. He can do anything. Probably literally anything. In this picture, a hackey sack has just been kicked up to the roof of a house. Before any of us had time to figure out what kind of hooked stick we were going to need, John was climbing buildings to fetch it. And he did. He soccers better than any gringo/human should, he can play guitar and harmonica like a pro, he makes cards appear out of air, and coins disappear into it. He eats alligators and lions and I think he helped build the grand canyon. He wished me Merry Christmas in Lakota and he doesn’t flinch at the thought of a frigid bucket bath. Mark (NC) is another legend in progress. The dimples and doe-eyes are a contrast to the rugged mountain looks of John, and his talent is not as obvious. But Mark’s power is equal in strength and utility. Mark, by some twist of cosmic error is the conduit of incomprehensible luck. I caught on to Mark’s ability shortly after he asked if I needed to use the internet at his house. Because if there’s a 1 in 36 chance that a volunteer will have internet access in his house, put your money on Marco. In fact, just give your money to Marco. 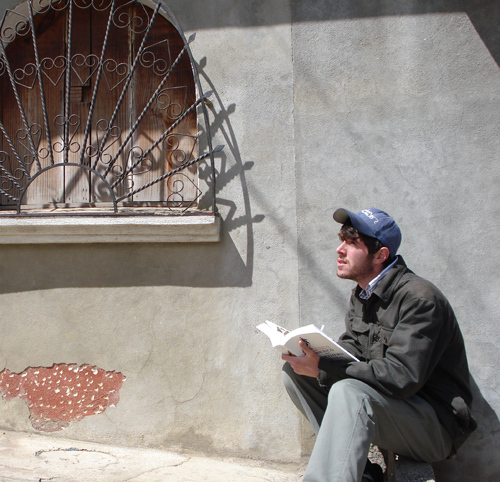 Mark (Marcosuerte) sort of wanders innocent through San Bartolomé with a halo of sunlight on his shoulders. Raindrops swerve around him. He breakfasts with mayors completely by accident and he takes hot showers. He knows nearly seven words of spanish, but he doesn’t always know when to use them. 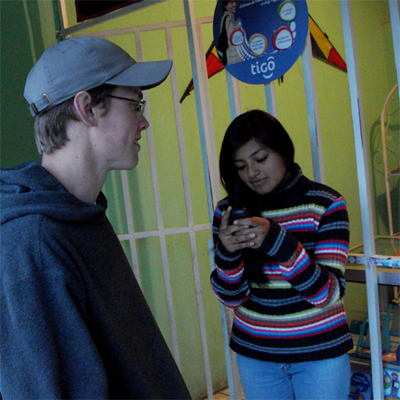 Nevertheless, I caught him at the cell phone tienda, where the pretty girl who works there was outside the store entering her name and number into his phone. But combine this inexplicable luck with the fact that Marco has the naiveté to actually ask for what he wants, and you find a boy that has and gets probably literally everything. I would hate him if we didn’t need him. I stick close to Marco because I know if anything goes wrong, he’s getting out of it. And if he has the best seat, at least the seat next to him is the second best. As for Andrew (VA), my talent is even harder to observe. I happen to know a lot. Here’s a picture me making observations and factual revisions in my field guide. I can’t seek out the arctic winter for fun like John and I don’t wake up with fine altiplano coffee like Mark, but I know probably literally everything. From diagnosing our new tropical diseases to averting international incidents, I have the seasoned smarts to get us into and out of trouble. I’m a bastion of preparedness and a wealth of information. I can talk prices down by at least 20% in the market and I can distinguish between harmless and deadly serpents (if we ever get to see any). Interpreter and spokesperson, I’m responsible for keeping Marco’s luck from being our last refuge. This is Team Bartolo. You didn’t elect us, but we’re representing you. And we’re not even screwing up. 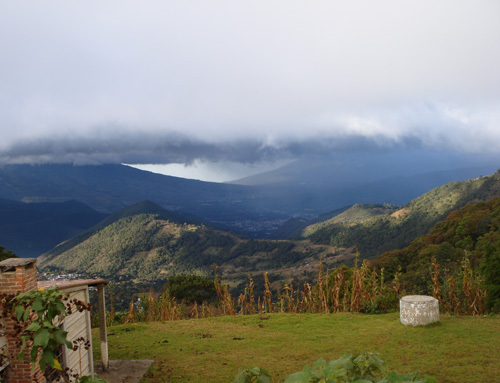 Last week we took a trip to Volcán de Pacaya to visit a current volunteer on site. On the way to the volcano, we stopped off at Lake Amatitlán. Amatitlán is a large, shallow lake about 13 kilometers northeast of Pacaya. The lake is probably all that remains of an ancient caldera. As we approached, we could see the water stretched flat between the rolling south bank and the steeply rising north bank. Egret silhouettes traded places along the tops and sides of colorful and tranquil fishing boats. It was a deceptive scene. 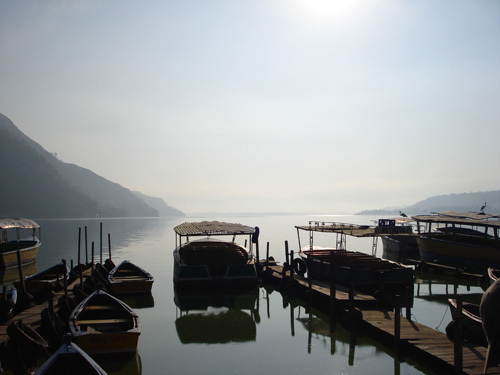 Amatitlán is the unfortunate victim of serious intersecting environmental problems. The rivers that bring water to the lake also bear domestic, industrial, and agricultural wastes. As a result, the water has extremely high levels of nitrogenous compounds, phosphates, and mercury. The entire lake is in a dramatic state of eutrophication. 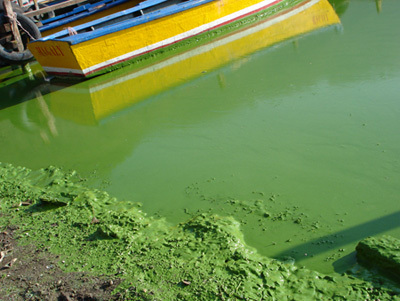 The flow of raw sewage and agricultural agents has stimulated a choking growth of algae, blocking the sun. As the plants in the lake died, the process of decay consumed oxygen, devastating animal populations. There are still fish in the lake, enough to attract a few little green herons and great and snowy egrets, but the ecosystem is far out of balance. At the surface, fish were visibly stranded in the thick green sludge. I had read about the contamination and reclamation of Lake Washington in Washington state, but seeing Amatitlán in the thick of eutrophic decline was a powerful illustration of a worst case scenario. It was also a reminder that the whole country requires serious water management solutions. The sheer scale of environmental problems we (residents of Guatemala) face is enormous. But instead of walking to church in San Lucas, I got up much earlier, walked much further, and got much closer to heaven (topographically speaking) by hiking to the top of the mountains behind San Bartolomé. A quarter of the way up, I could see San Lucas in the valley, below unseasonably gray skies. This is the dry season. The morning’s light drizzle was the first rain I’ve felt since I left the states. Halfway up the mountain, I was in the clouds. Altitude is something I usually get to ignore. But on the high streets of San Bartolomé, I struggle for breath. Hiking above those streets is even harder, especially in the belly of a cloud. As I ascended, visibility decreased. The straight, neat trees of the dry montane forest gave way to curled snags in the moist cloud forest. The trees were bristling with philodendrons, mosses, and ferns. Hummingbirds zipped after each other and I watched a small falcon toss itself into the air and hang in a shallow dive, stationary against the milky wind. At the top, there’s nothing to look down on. The world was completely obscured by water vapor. On a clear day, I should be able to see my town, but it wasn’t until I was halfway down the mountain that I could see the ground again. Before the end of the day, I attended a birthday party for the recently deposed mayor, ate the best guacamole I’ve ever had, learned to salsa, sharpened my soccer, and negotiated in the market in Antigua. But just down from the cloudy mountain, it was back to bed.